Vacations are always the best time to unwind, pig out and have a completely grand time. It is that once in a year experience that we all look forward to, whether you are basking in the hot and sandy beaches of Cyprus or enjoying the feel of the icy cold snow in Aspen. And it is during these times that we throw caution into the wind, forgetting about eating healthy or staying fit. We somehow have the notion that vacation and exercise just don’t mix. Most of us binge out during vacations then we scram to get in shape afterwords. Vacations do not necessarily mean we need to let go of our healthy lifestyle. Here are some simple tips you can follow to ensure that you have a nice time on your vacation and still stay fit and healthy. Most countries are known for certain sports, you can explore and try out the particular sport of the country that you are vacationing in, it will be a good way to exercise and at the same time learn about their culture. 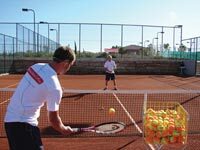 You can try the British rugby or get some Cyprus tennis experience. If you are staying in a hotel or a resort, chances are they are equipped with facilities for recreation and leisure. Find out what options are available and take some time off your sightseeing to whip your body into shape. Start your day with a heavy breakfast and since you are on a vacation and would most likely want to try out new delicacies, you can opt to eat a light snack every 3 hours just so you can make the most of your vacation while still keep to a healthy regimen. As you enjoy the new sights in your vacation paradise, might as well get your body moving and lose those extra pounds, you can try brisk walking along the Mexican mountain trail path, running along the sandy shores of the Bahamas, or getting a full body work out by enjoying a game of tennis in Cyprus. Avoid mixed drinks or juices high in sugar content and certain additives, opt for water and sugar free drinks instead. Do not over indulge in the heavier alcoholic beverages; a healthier glass of red wine is a much better alternative. Keeping yourself in top shape even on vacation is easily achievable, just keep in mind these very simple steps and keep those unwanted fats off your body all throughout the year.